TESCO, Scotland’s leading supermarket has been named as the main sponsor of the Great Wee Scottish Walk. 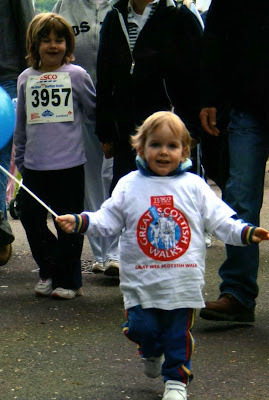 The series of eight walks aimed at children from 2-16 years take place at parks and prime locations across Scotland (Edinburgh, Glasgow, Aberdeen, Inverness, Dumfries, Dundee, Perth and Galston in Ayrshire) on selected dates from April to August 2008. This will be the first time that a Ayrshire Wee Walk has taken place and this will take place at Allseasons at the Meadows www.allseasonsscotland.com on Sunday 3 August 2008. It will be the second successive year that Tesco has supported the Wee Walk series of family orientated outdoor events. Participants can either choose to walk or complete a fun run over a distance of two miles for charity or a schools or community project of their choice. For young children there is a toddlers romp and teddy bears picnic. 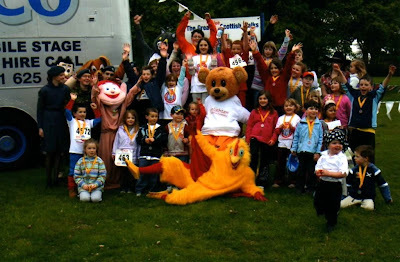 Charity Mascots normally start off the walks and lead the fun. Entrants completing the course will receive a goody bag and a certificate and medal to thank them for participating. The Ayrshire event will also include a bouncy castle, local produce stalls, Chaplin’s Disco Bus, Children’s bungee run, egg and spoon race, youngsters paint ball, live music and inter-community tug of war event. Entry to a wee walk or fun run is £5 per child (3 to 16 years) and parent / guardians and infants under 3 years walk free. The Toddler romp is a distance of 100 yards – entry to the event is free – please register online. Tesco is proud to support initiatives at both a national and local level, which encourage people of all ages and abilities to lead active and healthy lifestyles. In 2008 Tesco are supporting The Great Wee Scottish Walks, Falkirk School of Football, Farmhouse Breakfast Week, Royal Highland Educational Trust – taking the classroom into the Countryside and have teamed up with Kevin Keegan’s Soccer Circus and Glasgow City Council to offer over 850 school children the opportunity to take part in interactive sessions and learn about making healthy food choices. Tesco are also supporting Cancer Research UK’s Race for Life for the seventh year running and our Sports for Schools & Clubs scheme has seen nearly £2million of sports equipment and coaching given out in Scotland over the past two years’. Great Wee Scottish Walks is part of the Great Scottish Walk series of walking events. The Great Scottish Walk was first held in Edinburgh in 1998, with over 2,000 walkers taking part in aid of two charities. Now over 6,000 walkers of all ages, fitness and physical ability participate raising in excess of £1 million for over 100 charities. The Walks are promoted to all sections of the community, particularly encouraging groups, teams and families to walk. Inclusivity is one of the keys to the Great Scottish Walk’s success. Participants may choose from one of three distances; the 12, six or one mile course, after which walkers will be presented with a medal, certificate and a product bag. The Great Scottish Walk is held in Edinburgh (22 June) and Glasgow (25 May). Sponsors of the Great Scottish Walk include - Scottish Slimmers, Highland Spring, Paths to Health, NHS Scotland, Young Scot and the event is also part of the Governments Healthy Living campaign.